Yes, I was one of those who woke up at 4:30 this morning to watch the Royal Wedding of Prince William & Kate Middleton. Was it worth it? Yes!! 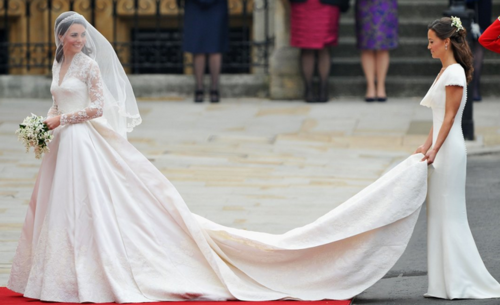 I simply adore Kate's wedding dress - minus the dip in the front neckline. Other then that her dress was pretty much my style - simple yet classic. And here's to hoping that wedding dresses with sleeves will come into vogue again. Here is a comparison picture for y'all. Look at the lace overlay and the sleeves. If you are wanting to copy Kate Middleton's dress may I recommend Vogue 2979. Did you watch the Royal Wedding? What did you think of Kate's dress? What was your favorite part? I watched the wedding!! I also thought her dress was nice. I think wedding ceremonies are always lovely..
Ha! We both asked similar questions! I love your post! I thought of Grace Kelly too! She looked beautiful and natural :-) I loved the hats too! I want to get some more big hats now! By the way, thanks for the email full of great almond flour recipes! I can't wait to try them! Oh! And I love your dress! Apart from the neckline, I think it's a lovely wedding gown. :) Not only does it have SLEEVES, but they're long sleeves, too! Overall, very elegant. I hope it sets better trends for wedding dresses! Love her hairstyle, too--simple, but beautiful. I also watched the wedding live. the moment I saw her dress I loved it, I have to say alot more elegant than the dress Di wore. 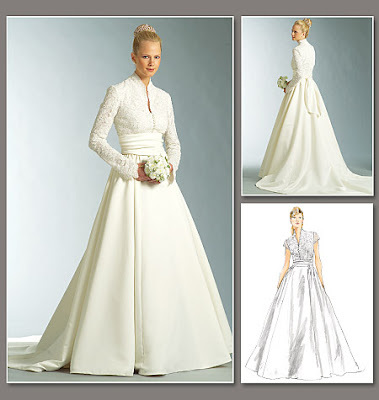 =) Although I agree with disliking the low neckline. 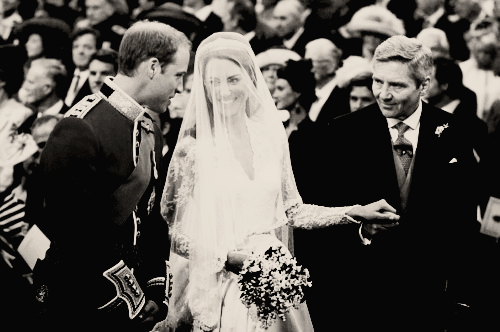 My favorite part of the wedding was them both in the carriage. She truly acted with grace! I love the lace sleeves! I like the dress, it's very beautiful! We saw some clips of the wedding but we were gone. The gown was sooooo stunning. When they said in magazines that she wasn't going for the Di look but something more modern, I was really afraid it was going to be a straight, no-frills kind of gown...not very royal to me. :-) When she stepped out of the car I squealed...she looked sooooooo gorgeous!!! I just could not stop saying the whole time (and all day after that) how incredibly beautiful and classy and ROYAL she looked. I think that she is going to make modest wedding dresses popular again!!!! Your blog post here is coming up top in Google for searches on "Modest Royal Wedding Dress," so congratulations on great writing and photos! 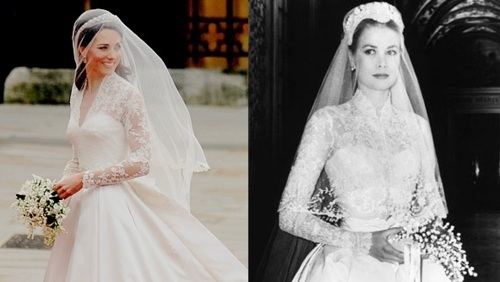 I agree with the similarities to Grace Kelly's dress and am interested to see your readers' comments on the dress. Many thought a slightly raised neckline would be sufficient to create modesty, while I personally thought that the tight corsetry of the bodice was distracting and that more of the lace could have been lined to avoid the suggestion of straplessness. You can see my Photoshopped idea of modest additions to the dress at FashionBelle.com. It looks like a beautiful wedding! We didn't have access to watching it, but I would have gotten up early and seen it with you! Did anyone else get up that early to watch the wedding with you? Agreed, Ashley! (Minus the dip in the front) Kate Middleton's dress was gorgeous! Grace Kelly definately has one of the prettiest I've ever seen. Achaia - That would have been so much fun! We could have drank tea and eat scones while watching the wedding. I wished we lived closer to each other. WE would have so much fin together. Yes, Hanne-col got up with me and Gabrielle woke up 20 minutes before the ceremony began. Though latter she wished she gotten up sooner with us. Oh, yes, Ashley! We would have a lot of fun together! Agreed... something about weddings does get a girl all excited! !